Tapologo serves the most vulnerable people in the district north of Rustenburg with holistic health care since 1994. Through various programmes, structured around seven Wellness Clinics, Tapologo brings hope to communities where socio-economic situations are deteriorating due to the scaling down of the mining industry in the region. These excellent programmes are supported by competent governance and administration implementing outstanding monitoring, evaluation and reporting. Finances are also managed thoroughly with various audits per year as required by funders. Seven Wellness Clinics, strategically situated in communities, bring health services to the communities in partnership with the local Department of Health. 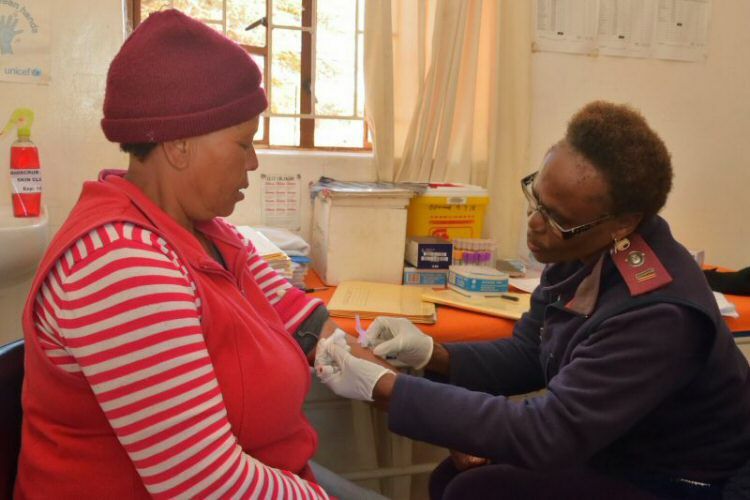 HIV testing, Anti-retroviral Treatment and psycho-social support is complemented with family planning and maternal and child care, immunisations, primary health care, management of chronic diseases, nutritional support and more. 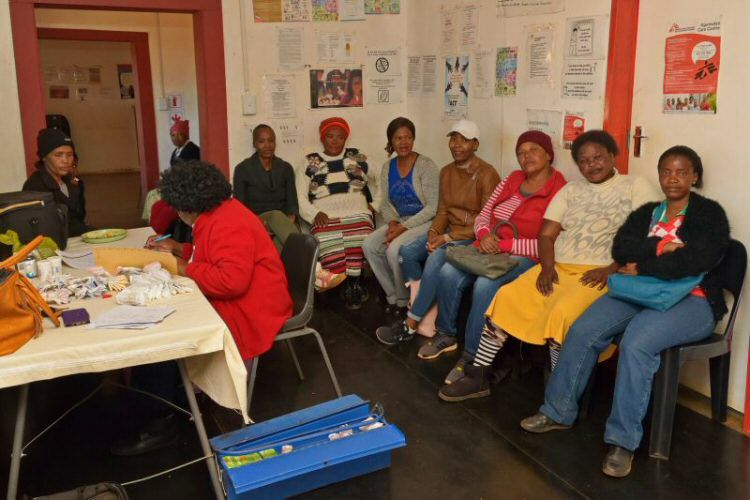 Tapologo provides Anti-Retroviral Therapy (ART) according to the SA Department of Health protocol to the poorest of the poor in resource limited settings. The more than 1 400 patients receive regular consultations and counselling. “I ACT sessions”, Support Groups and Awareness Campaigns are held to support successful commencement and adherence to ART. Left: Sr. B Rangoaga prepares to disperse Anti-retroviral medication at Tapologo’s Chaneng clinic. Right: Sr. M Tsame counselling a patient. An OVC child care programme for orphaned and vulnerable children has more than 950 registered children who are supported through a multi-faceted approach. Interventions include Psycho-social support, food plates, educational support, HIV education, health care and more. This programme improves the lives of children, through providing services to them directly and through capacitating others working on grassroots level. Above: Patients at Tapologo’s Chaneng clinic. Above: Sr. M Kaoroba taking a patients’ blood for further laboratory services. The Psycho-Social Support Interventions strengthens all above mentioned services. The number of people reached through these interventions are increased through closed and open Support Groups. Groups also deal with education and awareness. These services are provided by Social Workers. From time to time Tapologo also runs HIV Counselling and Testing and awareness campaigns to reach more community members. These intervention programmes form a support structure in the community and provide a much needed safety net for vulnerable people. Tapologo serves in areas where the influx of thousands of migrant mine workers resulted in the collapse of traditional community structures and values. In the many informal settlements HIV, TB, other illnesses and poverty are widespread. Above: Tapologo ensures that patients also receive much needed food for patients on medication. Through the years Tapologo has received many awards and accreditations for the excellent work in the community as well as the professional level of management, monitoring and evaluation. Tapologo’s past and present achievements have proven the organisation’s provision of quality care and the effectiveness and efficiency of its models. Tapologo plays a leading role in the Rustenburg HIV and AIDS Action Plan. Trainings and incentives for professional and semi-professional staff. Strengthening of private sector initiatives through partnerships. Furthermore, Tapologo practices “care for the caregiver” and actively promotes staff health and welfare within the organisation. Staff are protected from workplace hazards and a medical surveillance plan is in place for at-risk staff. The broad spectrum of funders and financial supporters of Tapologo have declined since the international economic recession of 2007-2008. This was followed by the labour problems in the mining industry. As a result, the mining industry has scaled down while the socio-economic and health situation in the communities deteriorated. In a time when the services of Tapologo became even more crucial and Tapologo increased its efficiency, support for Tapologo has also decreased! In short: Tapologo’s need for more support reflects the crises in the community where the need for health services has increased while the over-all provision and support of such services has diminished. For recent information about Tapologo, visit their Facebook page.